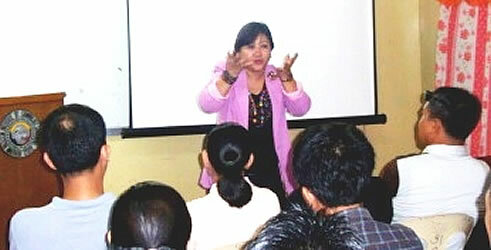 Vice-President for Research, Extension and Development, Dr. Milabel E. Ho keynotes the CCJE Research Forum. Prof. Mario Ritchie D. Hibionada of the College of Criminal Justice Education (CCJE) is a specialist in polygraphy. He presented his master’s thesis titled, “Polygraphy in the Field of Criminal Investigation at the Zamboanga City Police Office, Its Effectiveness, Problems and Prospects”, during the first CCJE Research Forum held on April 26 at the CCJE conference room. According to Hibionada, Poligraphy is a field in forensic science which deals with lie detection of suspects of a criminal case, Hibionada informed. A polygraph, which is also known as lie detector, is the main instrument that a polygraphy specialist uses, he said. It tries to determine whether the subject is telling the truth or is lying, based on certain physiological indices such as blood pressure, pulse, respiration, and skin conductivity while the subject answers a series of questions. The belief is that deceptive answers will produce physiological responses which are different from those that are associated with non-deceptive answers, Hibionada explained. The results of Hionada’s study show that the conduct of polygraph examinations in the Zamboanga City PNP office is effective as one of the tools in criminal investigation. It likewise showed that the major problems encountered in its implementation are: physical unreadiness of the subject; mechanical problems encountered in using the polygraph machine; and the failure of investigators handling the cases to submit complete records and documents of the cases to the polygraph examiner. Case documents are the basis of the examiner in formulating the questions that he will ask the subject. Meanwhile, Vice-President for Research, Extension and Development Dr. Milabel E. Ho, in an inspirational message she delivered during the forum, challenged the participants, who were mostly master’s students of CCJE, to develop more their thinking ability and creativity. She urged them to spur their inner dynamism and curiosity to aim for more answers to questions because, according to her, research starts simply with a nagging question that makes us start to think and investigate.